February 12 2019 – DUBAI, UAE: Former world No. 1 Caroline Wozniacki will be seeking to get back to her usual winning ways as she embarks upon her chase for a second title at the Dubai Duty Free Tennis Championships when play gets underway in just five days from now. The 2011 champion suffered a stuttering start to the season, losing in the second round in Auckland to a qualifier ranked 152 before the defence of her Australian Open title was ended by Maria Sharapova in the third round in Melbourne. But rather than dwell on such setbacks, they only serve to spur her on to greater efforts. She relishes the challenge any of her opponents represent. What Would Caroline Wozniacki Buy For Serena Williams At Dubai Duty Free? “I’m a competitor. I love to win. I hate to lose. I hate losing more than I love winning,” she said after her Melbourne defeat. “You know, that’s what drives you. That’s what drives me to try and be better and to improve and, you know, playing the best players in the world and trying to win the big tournaments. That’s why I’m here. That’s what I want to do. As well as on-court opponents, the amiable Dane has another that she has to deal with. After Wimbledon last year she discovered that she is suffering from rheumatoid arthritis. “In the beginning, it was a shock,” she said. “You feel like you’re the fittest athlete out there. That’s what I’m known for, and all of a sudden you have this to work with. Some days you wake up and you can’t get out of bed but other days you’re fine. You don’t even feel like you have it. You just have to be positive and work with it. And proof that she has been able to work around her situation came towards the end of last season, when she captured the 30th title of her career in Beijing. 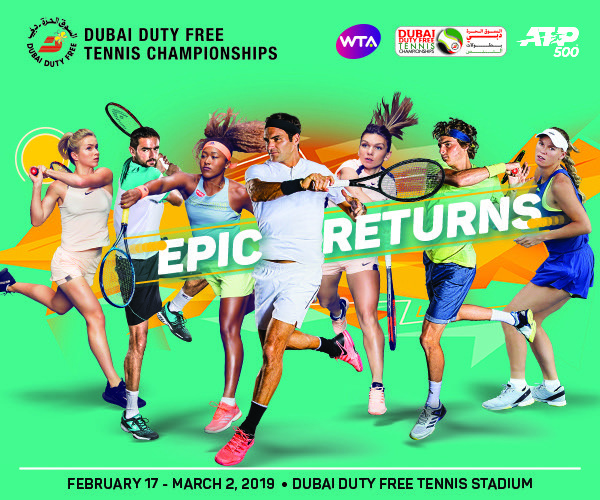 “Caroline Wozniacki has been a fan favourite over many years wherever she has played, and we are proud that she represents Dubai Duty Free as an ambassador throughout the world, alongside our reigning champion Elina Svitolina and recent world No. 1 Simona Halep,” said Colm McLoughlin, Executive Vice Chairman and CEO of Dubai Duty Free. Wozniacki faces a challenging week as part of a field that includes eight further members of the world’s top 10, led by reigning US and Australian Open champion and world No .1 Naomi Osaka and two-time Wimbledon champion, 2019 Sydney winner and Australian Open finalist Petra Kvitova. Others competing for the title include reigning French Open champion Simona Halep, two-time Dubai champion Elina Svitolina, 2019 Brisbane winner and Australian Open semi-finalist Karolina Pliskova and former Grand Slam champions Garbine Muguruza and Jelena Ostapenko. The sensational week of women’s tennis will be followed by an equally thrilling men’s event headed by seven-time champion Roger Federer, Australian Open semi-finalist Stefanos Tsitsipas, defending champion and recent Doha winner Roberto Bautista Agut, former US Open winner Marin Cilic and two-time finalist Tomas Berdych. Tickets are available online at www.dubaidutyfreetennischampionships.com and from the Stadium Box Office. For further information about the tournament please visit www.dubaidutyfreetennischampionships.com. Ahead of Sunday's main draw start, the former world No. 1 reminisces about her past Dubai excursions.